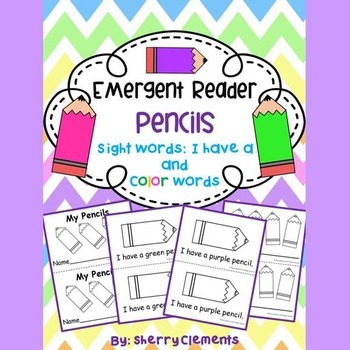 This emergent reader, “My Pencils” is connected to several CCGPS listed below. This 14 page book is designed so that you can copy the book, cut it in half, staple, and then it is ready for use. The 14 pages include a title page “My Pencils,” the next 11 pages contain black and white pencil pictures at the top of each page and a sentence under the picture. The black and white pictures allow for the students to identify the color word on the page and color the pencil the correct color. 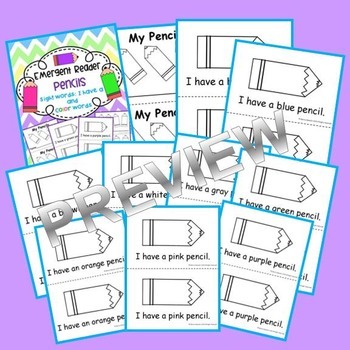 The last two pages include pencils pictures and a blank line without words for higher level students to write their own sentences or they can be taken out of the book if desired. This emergent reader focuses on these sight words: I, have, a and color words (black, blue, brown, white, gray, green, orange, pink, purple, red, and yellow). Page 2: I have a black pencil. Page 3: I have a blue pencil. Page 4: I have a brown pencil. Page 5: I have a white pencil. Page 6: I have a gray pencil. Page 7: I have a green pencil. Page 8: I have a orange pencil. Page 9: I have a pink pencil. Page 10: I have a purple pencil. Page 11: I have a red pencil. Page 12: I have a yellow pencil. 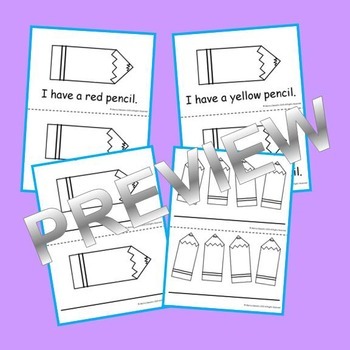 This emergent reader is coordinated (matching) to go with Pocket Chart Sentences: Sight Words (I, have, a) and Color Words (Pencils).